In the 1970s Tom Pressley carried out insightful research on the flammability of fabrics. It began with his demonstration that fire retardants previously used on cotton could be successfully applied to wool, an investigation that allayed the fears of the Boeing Corporation about the possible fire hazards of woollen fabrics and enabled Qantas to use woollen seat covers on the inaugural flight of their new Boeing 747s in 1971. It ended with his research into the factors contributing to children’s clothing fires and his development of new tests for measuring textile flammability. Tom rewrote the Australian Safety Standards for flammability and children’s clothing, putting them ahead of any others in the world. Tom Pressley’s interest in flammability arose during the 1960s when he was working at the Royal Melbourne Hospital on a range of issues relating to the use of woollen hospital blankets. During this research he became aware of the danger of fire because of the close proximity of volatile solvents and flammable textiles in the hospital environment. He made a preliminary study of this problem and the methods available for reducing flammability of cotton fabrics. In 1971 Qantas put its first Boeing 747 into service. The inaugural flight of this service was put in jeopardy because Qantas intended to furnish their 747s with wool seat covers, but the Boeing Corporation was worried about the possible fire hazard this posed. Based on his earlier work with cotton, Tom Pressley was in the perfect position to help Qantas out. After searching the literature on fire-retarding agents, Tom demonstrated that he could apply cotton fire-retardants to wool. The Wool Corporation was able to send Tom’s convincing results to Boeing with enough fire-proofed wool fabric to furnish a 747, and the flight went ahead. This experience and his contacts in the hospital community then led to a fruitful collaboration with the Burns Unit at the Royal Children’s Hospital, Melbourne. Doctors at the hospital were greatly concerned with the number of children suffering dreadful chest and face burns after their clothing caught fire at a radiator or open fire. Initially the research involved a study of the remains of clothing worn by children suffering serious burns. The type of garment, its design and the fibre content of the fabric were recorded and the data related to the nature and severity of the wounds. It was immediately apparent that garments, particularly nightwear, consisting of brushed cotton or brushed rayon fabrics were the main culprits. Pressure was put on retailers and manufacturers to remove such garments from the shelves but this was only partially successful. It wasn’t until publication of an article in Choice magazine that research on flammability testing was stepped up, in response to the public concern that the Choice article aroused. The Standards Association of Australia sought Tom Pressley’s help. He began by questioning what others has taken for granted – the flammability tests themselves. He found that different flammability tests that were used gave contradictory results, and began a period of long and exhaustive testing. This led to the rewriting of the Australian Standards, making them the best in the world. Keith Fincher and Bob Rowlands joined Tom in devising flammability tests for textiles. 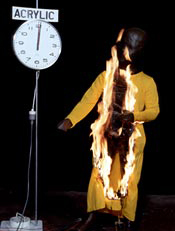 In order to obtain quantitative information a child-size Fire-Resistant Experimental Dummy, FRED, was constructed with temperature recording devices in appropriate positions. Garments of various designs and fabrics were then burnt on the model and the temperatures recorded as a function of time. Tom’s filmed demonstrations of clothing fires on FRED with the second hand of a large clock showing the rapidity with which garments were consumed, were disturbing and dramatic. The matter was taken up by the press. After studying statistical evidence together with observations using FRED it was possible to formulate principles for the manufacture of children’s clothing and Tom drafted standards for adoption by the industry which were accepted by the Standards Associations of several overseas countries. It was amusing, and illustrated Tom’s standing in the field, that he was later asked by the authorities, as an expert, to comment on his own draft standards. Flammability requirements for textiles were now becoming more sophisticated particularly for use in aircraft. Smoke and toxic products from burning fabrics were now recognised as major hazards in fires of all sorts and it became important to improve the already excellent flame resistant properties of wool. Peter Gordon and Laurie Stephens joined in this aspect of the research which continued for several years in collaboration with Geoff Roberts from the Australian Wool Corporation. McKay A, 1976, ‘Trouble shooter for wool’, In: Surprise and Enterprise, Fifty Years of Science for Australia, White F, Kimpton D (eds), CSIRO Publishing, pp.24-25.